It's bad enough buying pants for myself. This year, I decided, hey, I'm going to buy a new pair of jeans for someone who needs a pair. Great. It's one of those 'adopt a family for the holidays' drives. Great. I can do that. Knowing only what number size to get, I set off to Target, like I do. and I had a conniption all over the denim wall. "I don't know what she looks like!" I yelled. And then I just stood there, holding both pairs, not knowing which one would be the correct one. and how tremendous your thigh and calf muscles are (mine are pretty damned great). I ended up putting them both back on the wall, and picking out a pair of pants from somewhere else entirely. But I wish size numbers didn't mean anything. 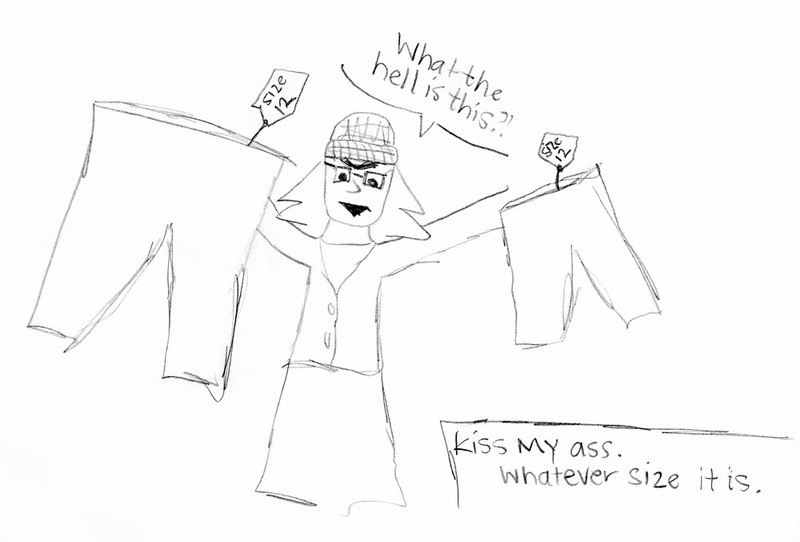 People say, well, men's sizes are the measurements, so women's sizes should be like that, too! But those numbers mean things, too. And numbers that are too big ruin us. I think that's why we made up this whole other number system for women to begin with. I have very little idea what size I am anymore. Just give me all the elastic waistbands you can find. New in 2018! Audio Companion!